We have been seduced by half-truths and whole lies since time began. Remember the garden? 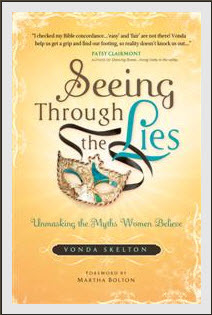 In Seeing Through the Lies, author and speaker Vonda Skelton humorously addresses the disappointments women experience as they search for truth while believing a lie. Each chapter opens with amusing anecdotes from real life and ends with answers and guidance straight from God s Word. Exploring topics such as pride, fear, motherhood, and the busyness of life, this book offers practical steps for peeling away the layers of deceit and finding the joy of living in real truth. Through honesty and humility, Vonda takes women on a hilarious journey through all things female and brings them to a soul-searching point of decision. Readers will identify with both the positive and negative examples of women in the Bible, and will be encouraged by Scripture, as well as quotes from notable men and women. Each chapter ends with five steps for exposing the lie and embracing the truth of God s Word.